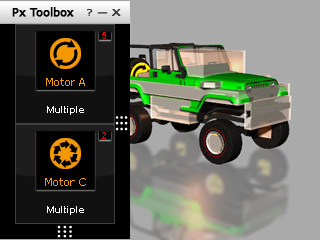 In the Physics Toolbox, you get a free bonus structure that is almost suitable for use with any kind of 4WD (4-wheel drive) vehicle. 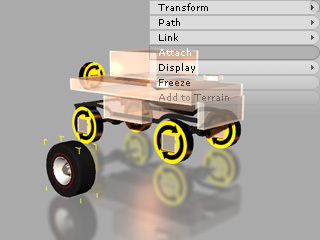 The bonus vehicle is actually composed of two main parts, one is the true meshes of the vehicle that include the hull, the chassis and the wheels; the other is a physics structure with constrained dummies that are used to provide power, to control the direction and to to generate suspension effects for the entire vehicle structure. 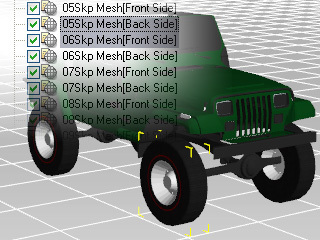 The vehicle is composed of different meshes. Also included are dummies to provide physics effects. 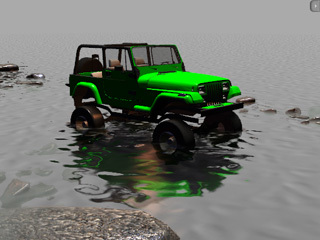 The green monster truck you get from the Physics Toolbox is downloaded from the Google 3D Warehouse and the copyright belongs to the original author. Do not re-distribute it or use for commercial purposes. 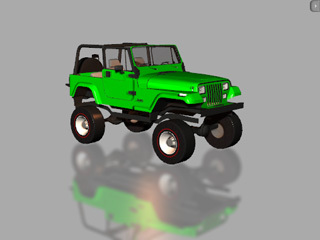 You may download any sort of vehicle from Google 3D Warehouse or create one for yourself, and then follow the steps below to generate your custom 4WD. 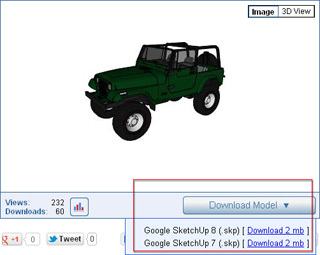 Download and save the desired car model (*.skp made by Google SketchUp 6, 7, 8 only) from the Google 3D Warehouse. 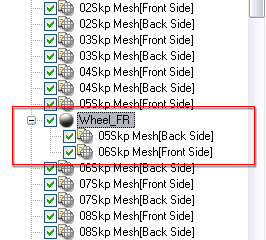 Load the model into 3DXchange 4 or later version. Double click on the part or parts you want to dissect. 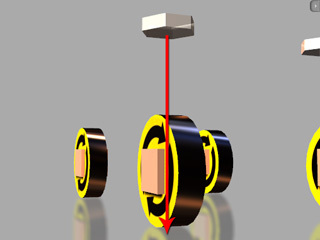 Click the Make Sub-Node button to define the part(s) you want as an isolated sub-node of the model. Repeat the step until all the desired parts are isolated. 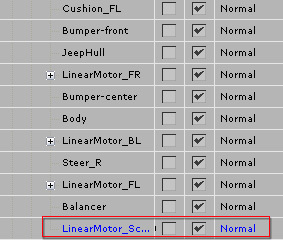 Export the entire model to iClone. 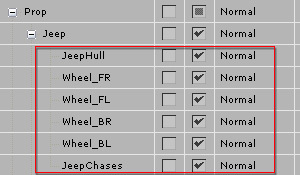 The dissected parts can then be seen in the Scene Manager and be individually modified. For more information about making sub-props, please refer to the Converting Model to Static 3D Prop section of 3DXchange Help. After the meshes are prepared, you are able to assign them to the physics structure. The meshes do not need to be Physics Objects because the physics dummies of the physics structure take charge of the reaction to the physics simulation. Select the physics structure. Make sure it is located at (0, 0, 0). Apply the converted car from the Content Manager. Select a dissected part of the car. Right click on the part and select the Align command. Click on the target dummy of the physics structure. In this case, the front tire is attached to the Motor A at the front. Transform the part so that the position, the angle and the size are aligned to the dummy. Repeat the previous step until all parts are attached to their corresponding dummies. 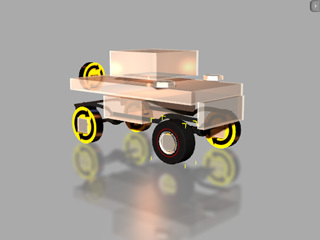 The chassis and the hull parts are attached to the Body dummy of the physics structure. The tires are attached to the Motor A dummies of the physics structure. 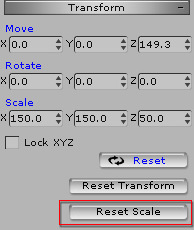 Reset the scale of the parts to prevent from sudden distortion during the simulation by selecting the root of the entire structure (the car mesh plus the physics structure) and clicking the Reset Scale button. For more information, please refer to the Fixing Sudden Transformation During Simulation section. 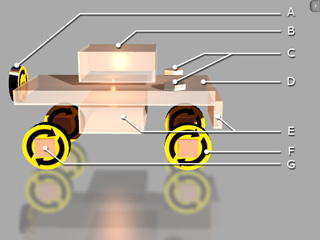 After the attaching is done, you are able to control the vehicle via the Control Tile Panel. If the Control Tile Panel is hidden, then select the dummy that is highlighted in blue in the Scene Manager. 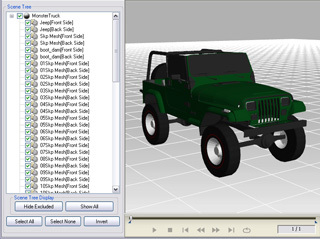 Right click on the 3D viewer and then select the Script >> Physics Toolbox command in the right-click menu. The Control Tile Panel will instantly appear. Using right-click menu to show the Control Tile Panel. Use the Motor A control to determine the speed of the vehicle. Use the Motor C control to determine the direction of the vehicle. 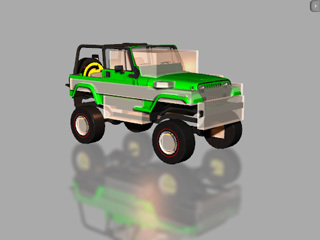 You may open the Advanced Panel of the Motor A to set the max speed of the vehicle and the Advanced Panel of the Motor C to set the max rotation angle for the front tires. 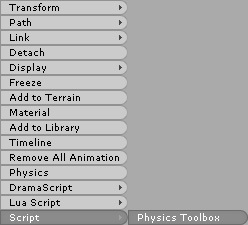 Physics Object with Lua Script: The only physics object that holds the lua script. Mass Balancer: It is used to balance the entire structure from tilting. Steering columns: For turning left or right. Main Body: The root for all constraints and attachments. Bumpers: Keep the structure from penetrate into other physics objects. Wheels: Propelling power of the entire structure. 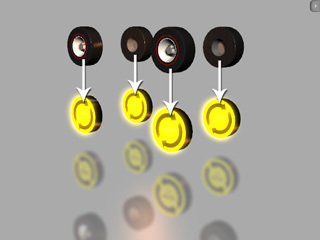 Suspension Systems: Spring effects for the wheels. 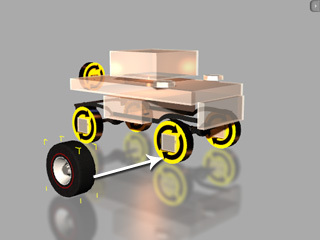 The four wheels (F) are constrained to the suspension systems (G) by Hinge constraints. 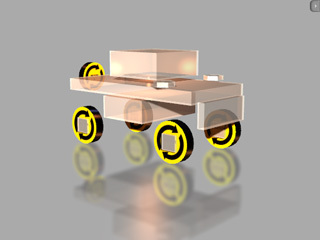 Align the steering columns (C), the suspension systems (G) and the wheels (F) to the vertical line (Z axis). It ensures the structure remains intact even when it encounters heavy motion impacts on a bumpy terrain. 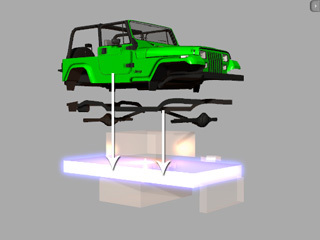 Use the balancer (B) cube to adjust the mass forward or backward; it will keep the car balanced despite sudden movement or when it hits the bumpy road to prevent the car from flipping. The suspension is rock hard and the main body remains high. Creates the smoothest air-cushioned suspension, no jittering after stopping, and is the most comfortable design. The suspension effect is extremely hyper, soft and jumpy; but the result is quite good. The suspension effect is too sensitive, which cause the car to fly around a little too much. 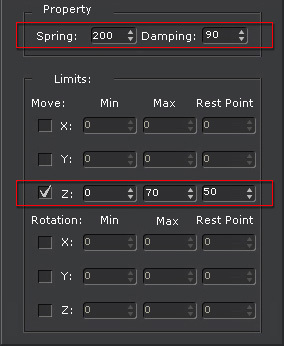 If the Spring equals to 20, you can get a very soft and slow spring effect, which creates a more cartoonish appearance.